In Godsforge, 2-4 players must battle for control of the last known place where the precious resource Etherium can be found. 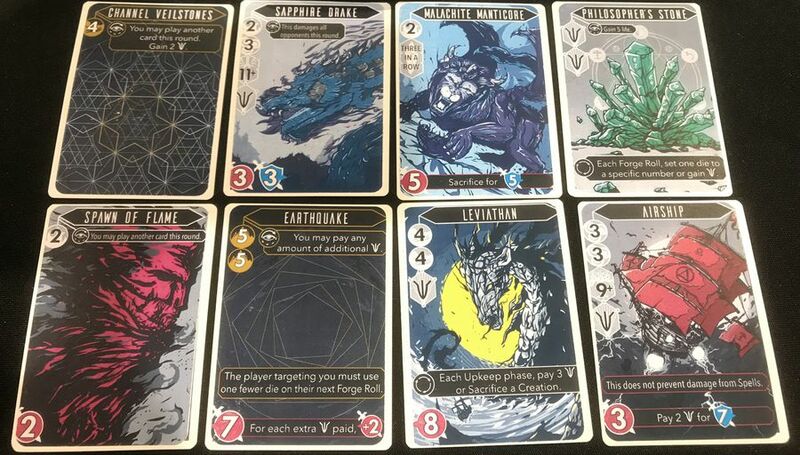 Godsforge is a dice and card game of simultaneous play, with each player attacking to their left and defending from their right. On their turn, each player can roll four dice up to three times and select one card from four in their hand. Cards can be spells or creations which will help you defeat your enemies. In any order, a player may reveal their card and pay the cost to activate it, use spells and creations, and play any special abilities. Players may also use any unspent six dice to purchase a veilstone - a powerful item which can help in later rounds. Once all cards have been resolved, players assess the amount of damage they have taken, discard any cards they do not want, and redraw their hand up to four. Once one player is eliminated, all remaining players begin to take extra damage to quicken the endgame. The player is, obviously, the last spellcaster standing! 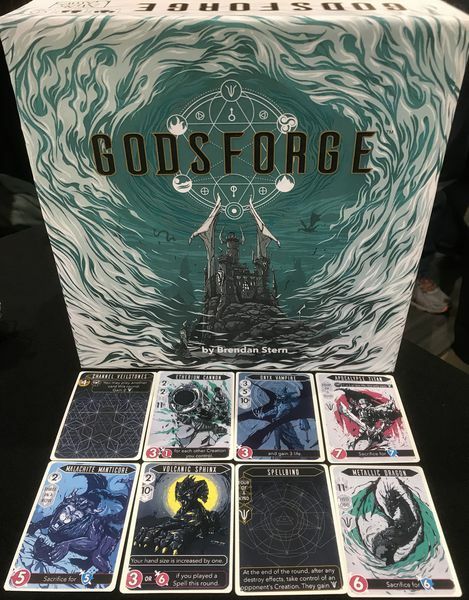 Godsforge was first previewed at PAX Unplugged 2017, and features some pretty interesting artwork by Diego Rodriguez. It should be available from early 2019, so interested sorcerers can keep up to date through the Atlas website. How important is artwork in a game? Tell us your thoughts below! "In Godsforge, 2-4 players must battle for control of the last known place where the precious resource Etherium can be found!"